One of the foundations of The Shell Case is the search for companies that produce great toys and games that deserve attention from the wargaming community but may not be getting. One such company is called Fantascape. Fantascape produces a small but growing range of bases, accessories, and scenery and as the business was just getting their site off the ground it seemed an opportune time to do a review of their stuff. 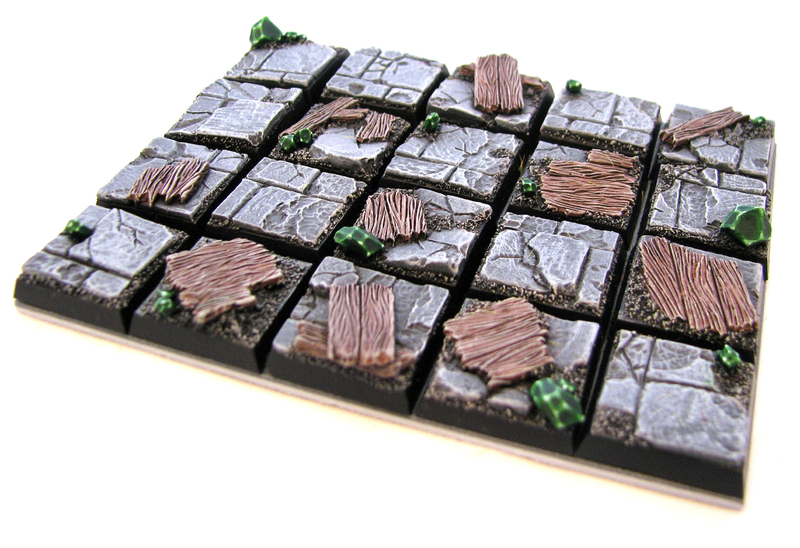 I got to take a look at two of the bases ranges – Wyrdstone Mines and Glacial Ruins. Let’s start with Wyrdstone Mines. So there we have it, just finished reading the last few pages this morning while the gf got ready for work…and all I can say what a book! The 12th book in the HH series follows the Thousands Sons from before and after the Council of Nikaea and also during the burning of Prospero. I won’t give too much away for those who have yet to read it, but what I will say is that it is a page turner. Second post in the space of two days… I know, don’t die of shock. 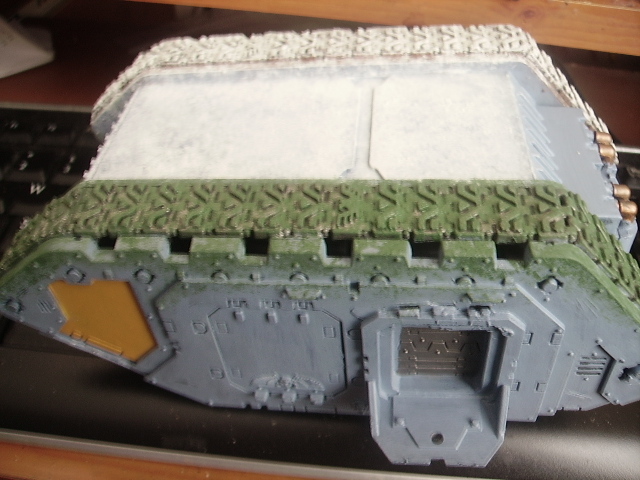 Anyway, this one is a small tutorial, and I’ll try and do one a week on different weathering techniques, from basic drybrushing to using salt and Liquid Green Stuff. Now as most of you know, when it comes to my own army, and especially the vehicles, I hate them looking shiny. Most armies, mine included, don’t always get back to their homeworlds that often. So to mirror this, the armor, on the troops and tanks should look worn and battle damaged, this includes some very heavy weathering to make this happen. 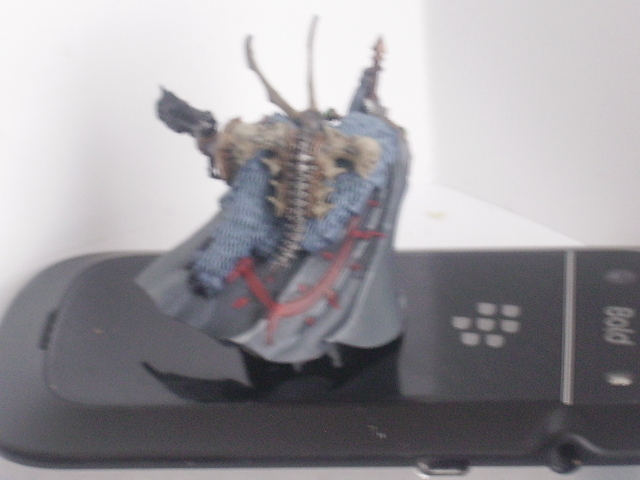 So in a series of pictures, and small explanations of techniques and paints used, I hope to give you all some insight on how I achieve this. 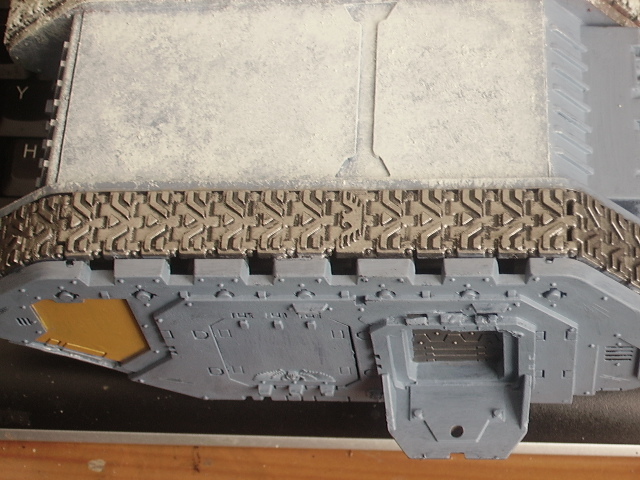 To start, I always prefer a black undercoat, I find it especially useful when doing metal. 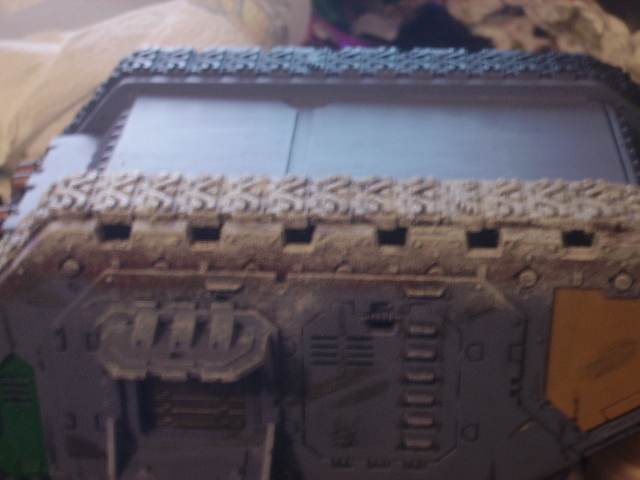 Which ofcourse, as you’ll see from the pic, there is a fair bit of metal work. To follow on from this I put a light, in other words you don’t have to make sure it fills all the area’s, coat of Leadbelcher. This is a nice dark(ish) metallic paint from Games Workshop, and is a brilliant basecoat for all things metal. After that has dried, I always get hold of my medium dry brush and and use it to do a stipple effect with Liquid Green Stuff. 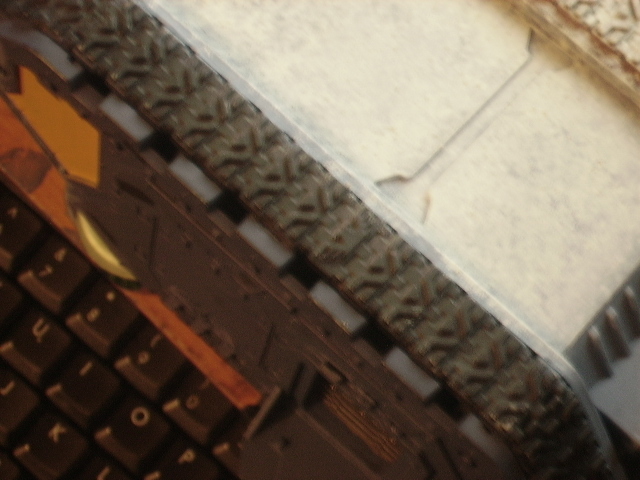 Now using it this way, can, and will, cause damage to the brush itself. However, I only use this particular brush for this sort of work, and yes I do have one that I use for drybrushing, so I’m used to the damage caused. Once the LGS has dried, I then put on a fairly liberal coat of Mournfang Brown, this will give a nice mud effect without being to overpowering. I find it easier to use it than I do with Devlan Mud, which is the texture paint, and it gives a slightly better finish for what I’m after in the end. Now it doesn’t entirely matter if you are neat with it or not, most of it will be hidden in the end, but why the mud colour, why not white, I hear you all ask. Well… have most of you driven through snow on a field? 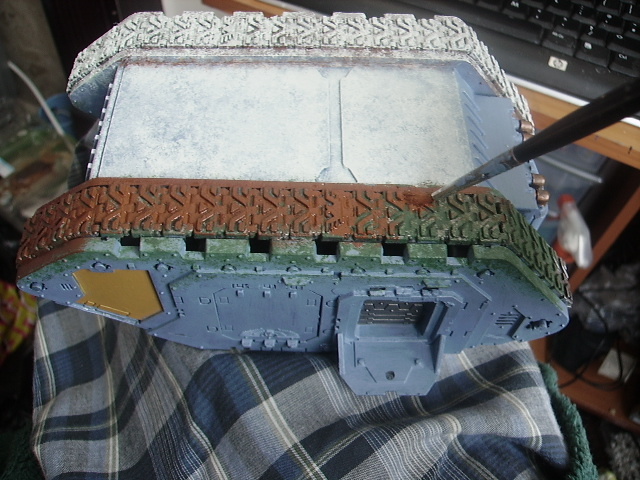 I churns the ground up beneath it, so that’s why I like to use a muddy colour as a base coat, just to reflect exactly what would happen on a battlefield. So after that, you just add Mourn Mountain Snow, which is one of the texture paints, to the tracks and surrounding area’s. Again I use the dry brush to put it on, and this gives the end effect of frosting, it also gives it a very realistic view. So this is, like I said earlier, the first of many tutorial posts on how you can make something look more realistic on the battlefield using a simple weathering technique. If you’ve enjoyed reading this, and also have tried some of my tips with success… or failure, then please comment. 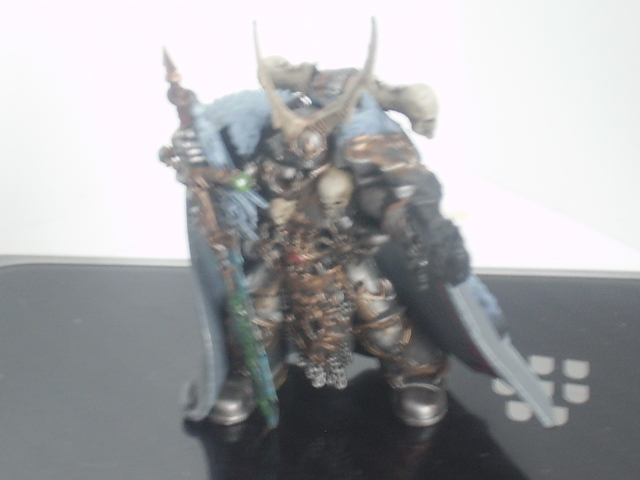 So, this week I’ve managed to make a new model for my own Space Wolves Army, as well as start on my sons new Chaos additions to his. 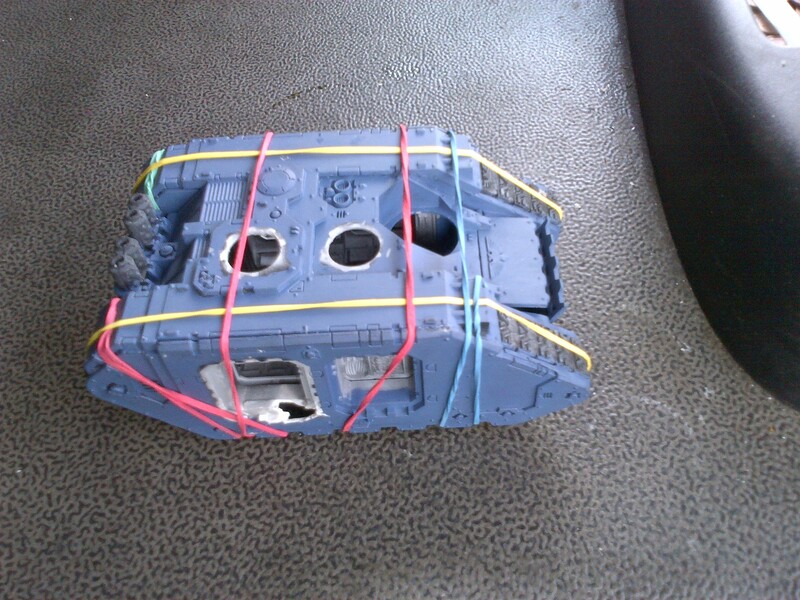 All this alongside updating the website for Adaptus Paintarium… so all in all not a bad week as far as modelling goes. So to start on the Space Wolves. Last Sunday I decided that I didn’t have a standard bearer for my army, and I don’t really like the Games Workshop one… why? 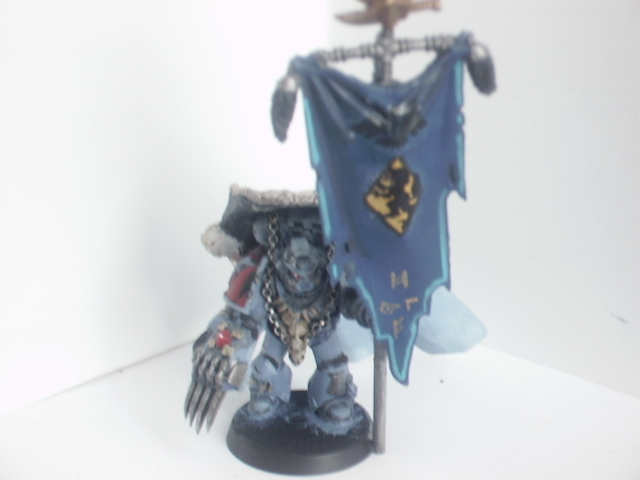 To be honest, it doesn’t look right, yes it’s fine if you have a generic army… something Space Wolves certainly aren’t. Though I still have to base him, he will certainly make a lovely center point for my troops to gather round. 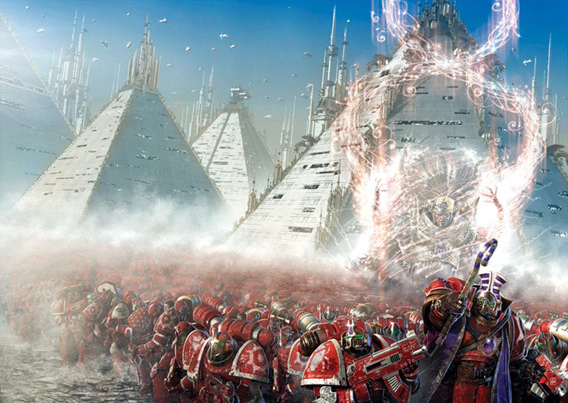 The thing is, unlike other Space Marine armies, who have a command squad, Space Wolves don’t. The standard bearer is usually included in the Grey Hunters pack, and as far as I can figure out he isn’t there to fulfill any purpose other than to look good. I’m hoping he really likes this colour scheme, and I think it works out really well. #Warmonger and #ForgeWorldOnly meet 6.7.13. So while at work I’ve been doing various work on it and breaking it down for new parts to be fitted. Yesterday, however, was not as good a day as it should have been. As most of you know I’m trying to start up commission painting business, and on Facebook I got one bloke that decided to slam into my work, but after mentioning it to my twitter followers they all got my confidence back up in my painting abilities. So whats with the title of this post?